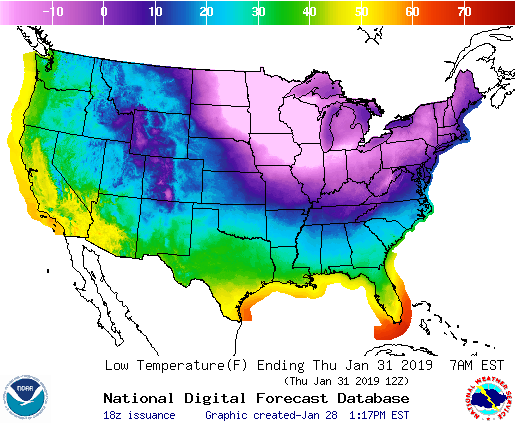 Nearly 90 percent of the continental U.S. will experience below-freezing temperatures over the next five days as Arctic air moves south, according to forecasts. The “polar vortex” event will have 89 percent of the continental U.S. with below freezing weather, meteorologist Ryan Maue said. In fact, all of the lower-48 are forecast to experience freezing weather, including Florida. The National Weather Service (NWS) is warning of “extreme and dangerous” cold weather across the Great Plains and Great Lakes where wind chill could dip as low as -60 degrees Fahrenheit. NWS expects temperature “lows in the -30s and -40s” Wednesday through Thursday. CNN reports that 75 percent of the U.S. population, more than 220 million people, could see below-freezing temperatures in the coming days. Frigid weather is expected to shatter dozens of temperature records throughout the eastern half of the country. Farther north, Ennadai Lake in the Canadian Arctic could see wind chill as low -81 degrees Fahrenheit, NWS reported.